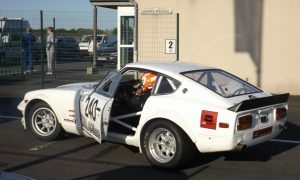 As the main contact for the Z event, each Le Mans Classic begins for me almost 12 months before when I start posting up about the event. However, inevitably nothing happens until December when people begin to wake up – by which time it’s almost too late to book any track sessions ! 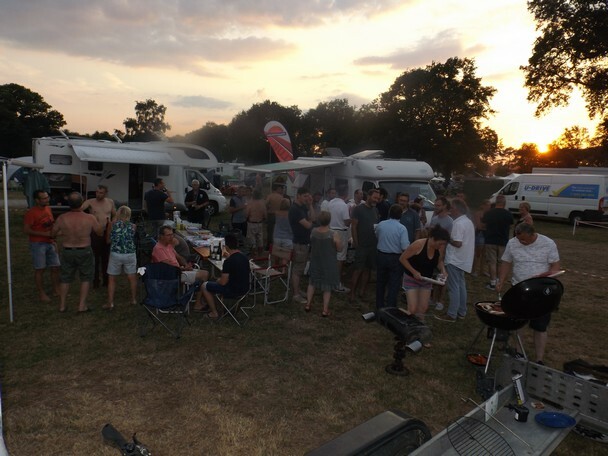 During the event, most of us stay on the circuit campsite and we’ve found a pretty good spot, calm-ish, clean toilets and showers just 5 minutes from the club stand. Even walkable if you so desire. This year, people stared arriving during the week but unfortunately my work commitments got me there late Friday evening. Happily I could count upon friends to mark out our reserved space. We had a pleasantly warm evening watching others of all makes arrive and may have stayed up too late! 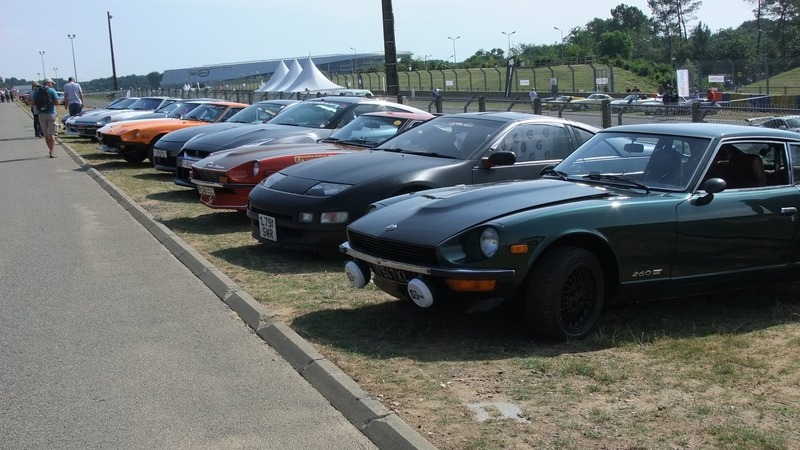 Next morning we headed up to the stand and I was proud to be driving a rare 280ZX Turbo. We put up the flags, banners, installed the table and camping fridges and our space quickly filled up. 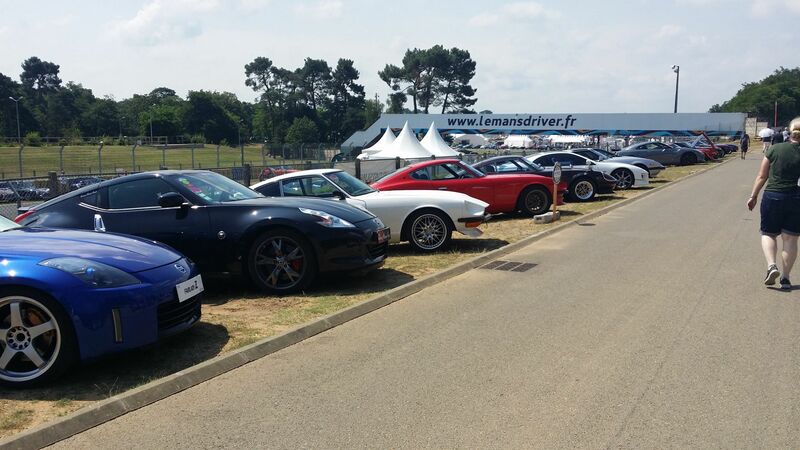 We had asked everyone to come and join us for an aperitif at midday – the idea being to have one moment during the weekend when all the people with all of the cars in our of the colours were together and we did pretty well – all 40x bottles of champers were drained! 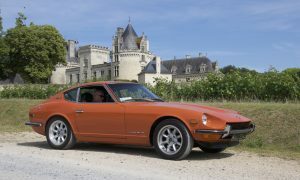 We had Stephane and his son Alexandre turn up who’d done the Paris-Peking rally in their dark green 240Z….we’d previously helped them out whilst in Siberia with some distributor problems. We toured the pits / paddocks, met up with Rob Crofton, a great bloke who was competing again in his Super Samuri. We generally soaked up the fumes, oohed and ahhed – a paddock pass is a must and isn’t expensive when booked through the club! (me). 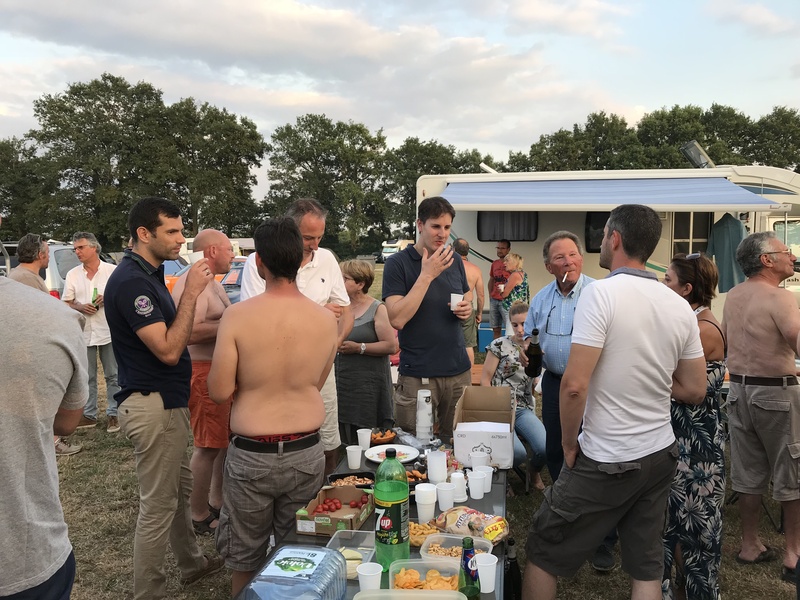 We headed back to the campsite for a rest, went up to the BBQ and Hubert refilled our glasses with his own special brand of cold champers –such a struggle, and all this under a clear, hot sky too! Friends, Zs, good food with wine and beer, everyone eating together – it was a great atmosphere and wonderful to meet old friends again and make some new ones. I was determined to go back up and watch some night racing, so a few of us piled in a couple of Zs and drove up to our stand. Surprising there were no queues at nearly 11pm! The night racing was fantastic, it was a real privilege to see, hear and ‘feel’ GT40s and others as they roared past, no electric or diesel engines here – just real internal combustion! 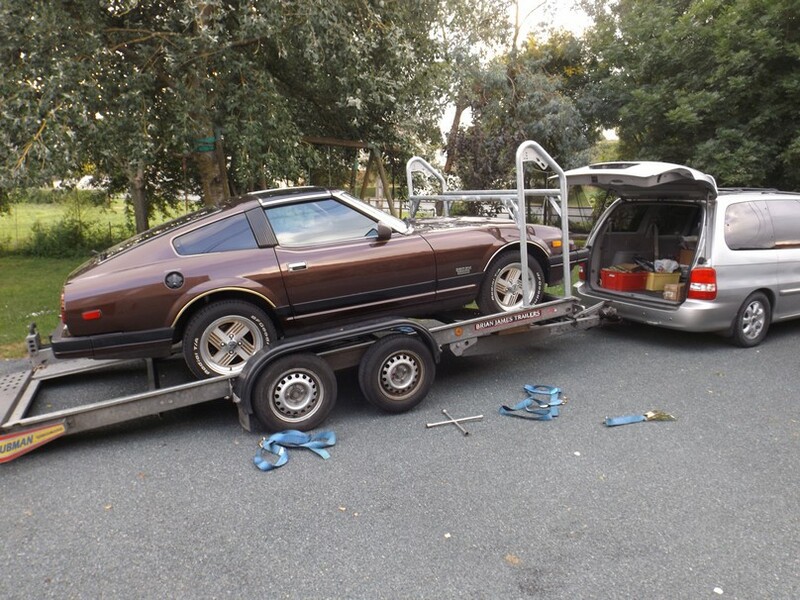 The following morning a good breakfast of pain aux raisans, coffee and fruit juice helped us get back up to the stand where we got a phone call from Rob C. « I’ve got a driveshaft problem – can you help ? ». 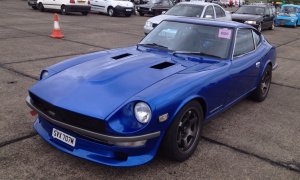 A quick word with JohnyMD who was there with one of his many Zs, fortunately a 280Z using the same R200 diff as Rob and he agreed – another great bloke and anyway, how could we refuse and leave Rob not to finish his last race ? John drove me around to the pits and we bluffed our way through 3 or 4 control posts before pulling up in front of Robs’ Z. His team quickly began to strip off one half-shaft and replace it with their dodgy one. 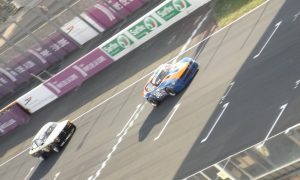 John had said that he’d limp out of the circuit and call the AA to get home but finally drove back if I’m not mistaken! 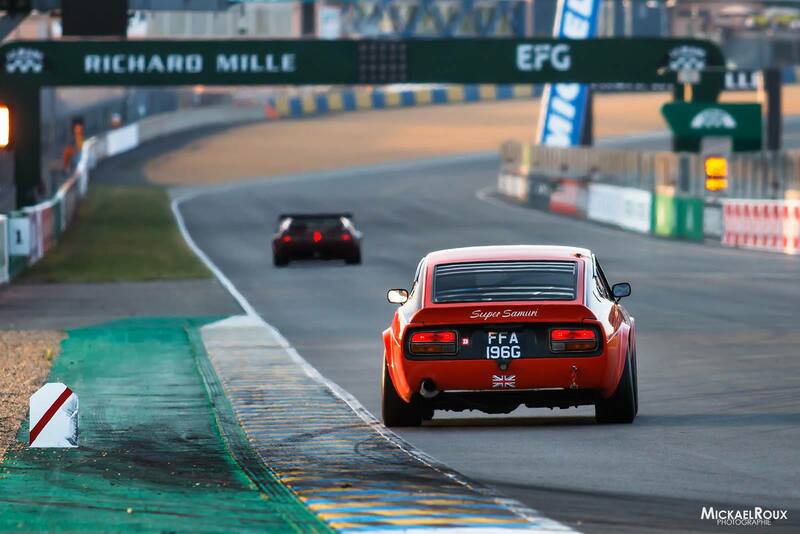 This isn’t the first time club members have pulled out the stops to keep a Z in the race and just mirrors the fantastic atmosphere of Le Mans. Again, thanks John and well done Rob for merely being there – at a €9k entrance fee plus expenses it’s no small dedication! 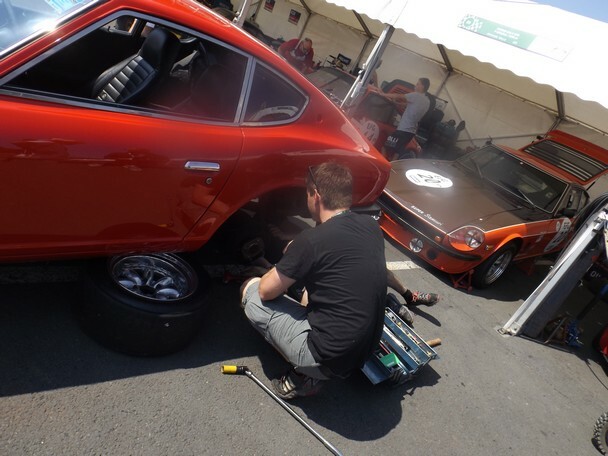 In the pits we met up with a Japanese guy and his mechanic friend who works at Nismo so we introduced them to Huberts’ Japanese friend who rallies a replica Monte Carlo 240Z on the historic tour. The really car is still garaged here in France waiting to be repaired following an ‘off’ in the snow. 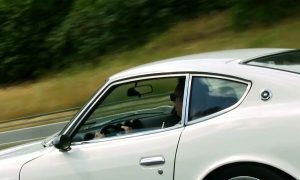 We drove back towards the campsite and encountered a cumbersome Buick which promptly reversed into the bonnet of Davids’ blue ‘racing’ 240Z! Livid, he raged that it was only a year ago that someone did the same thing….never seen the cool guy so furious but happily his car is now back in his garage wearing a brand-new bonnet from the USA. We waited a while for the traffic to die down, in fact you have to until they open the ‘Mulsanne Straight’ (‘ligne droite des Hunaudières’ for the French). This is what is was like : https://www.dailymotion.com/video/x9lp23 so we had a drink and a chat whilst others queued up in the heat! 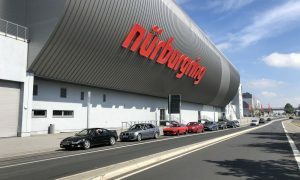 After months of build up, it was all over to soon – but we had around 50 cars and nearly double that in people and I like to think everyone enjoyed the weekend. 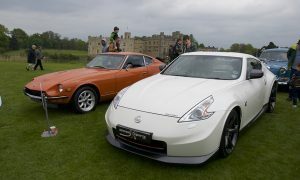 I had a leisurely drive home across country, dreaming of doing the event in 2020 in my Z where we’ll be celebrating 50years of the Zs’ appearance in Europe. We’re hoping to attract Zs from all over Europe to mark such a special international event – please consider joining us and don’t leave it too late to book! Thanks to everyone who came this year – my only reward for the hard work and time is to see so many smiles, cars and of course….watch at least one Z race, didn’t he do well too! To continue the discussion, you can chime in on the 2018 Lemans thread here.